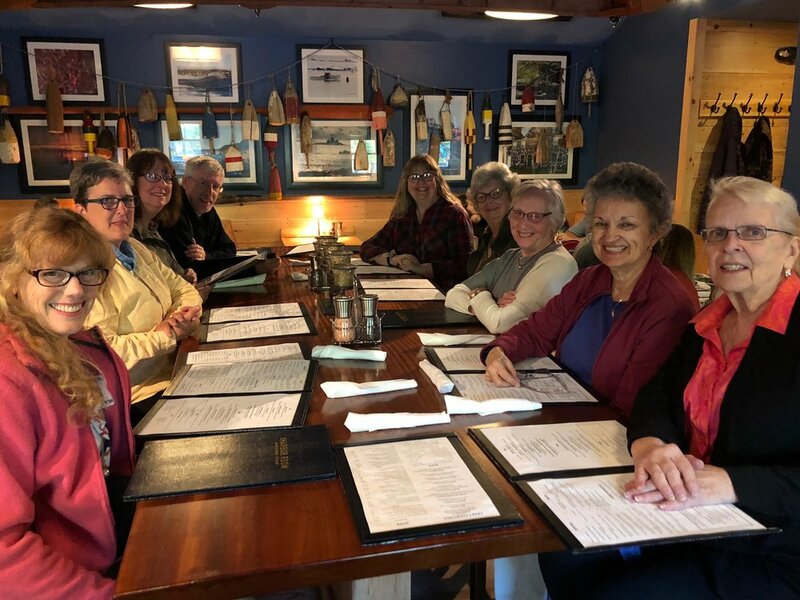 PSME hosts an annual early summer painting retreat weekend at Hotel Pemaquid, near Pemaquid Point Light in Bristol, ME. This retreat offers PSME members and friends with the opportunity to paint in stunning locations and attend two structured critique sessions and a pastel demonstration presented by a visiting artist. The retreat builds camaraderie between those attending and is a great way to meet new friends that share the passion for painting outside. PSME's Annual retreat now features a fireside cocktail party generously hosted by Hotel Pemaquid. This Thursday evening event puts artists in position to start painting bright and early on Friday morning. It is a nice, relaxing way to catch up with friends, meet new folks, and to enjoy the beauty of the area and the hotel a little longer. We seek a nice balance of plein air time and gathering time! The rugged coast and indigo water of Pemaquid Point always inspire us for wonderful painting experiences. The hotel's carriage house is available as a studio as well. Plan to reconnect with your artist friends. A visiting artist's demo, two optional critiques, and camaraderie make this an event all can enjoy. The 2019 visiting artist is Lisa Regopoulos. When Realism meets Impressionism in pastel, that's where the excitement begins for this Massachusetts artist. That's how she likes to paint. It need not be a specific object, but a strong shape or pleasing color harmony combined with movement and texture that get transformed into an impressionistic pastel. First impressions of a scene, life in real time, the beauty of the now are the moments she wants to capture. That is why plein air painting excites her most. Her plein air work is fresh and evokes the feeling of whatever is happening at that moment in time. Her enthusiasm for pastel and plein air painting has led her to learn from some of the nation's best Artists in pastel, watercolor and oil at the Plein Air Convention and the IAPS Convention in Albuquerque, NM. She has attended many intensive workshops in order to keep growing as an artist, and to learn about new techniques and trends. One of her favorite intensive workshops was a week of plein air pastel painting in Tuscany last May. Early reservations at the hotel are strongly recommended as the retreat is in June, a favorite month for weddings.